Set in England in during World War II in 1940, Miss Price (Lansbury) is learning how to become a witch when she has to take in three children who were sent to the country and away from the bombing in London. Because of the war, the Witch’s College-run by Emelius Brown (Tomlinson) closes so Miss Price and the children travel on a flying bed to London to learn a spell that will help England in the world. -Lynn Redgrave, Judy Carne and Leslie Caron were also offered the lead role in the film, according to the American Film Institute. -Based on the novels “The Magic Bed-Knob or How to Become a Witch in 10 Easy Lessons ” and “Bed-Knob and Broomstick” by Mary Norton. -Debut for child actors Cindy O’Callaghan, Roy Snart and Ian Weighill. -Songwriting brothers Richard and Robert Sherman wrote the songs for the film. The Sherman brothers said in an interview that the song “The Beautiful Briny” was originally written for “Mary Poppins ” (1964) but wasn’t used. -Walt Disney bought the film rights to the first Mary Norton story in 1945, according to the American Film Institute. David Tomlinson referees a cartoon soccer game. 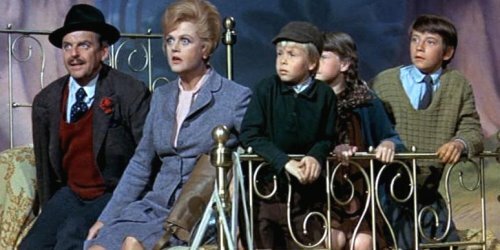 “Bedknobs and Broomsticks” starts out with great potential. An excellent cast with Angela Lansbury, David Tomlinson, Roddy McDowall, Sam Jaffe and Reginald Owen. A seemingly adorable premise of child World War II refugees paired with an unlikely host who dislikes children and happens to be an apprentice witch. But after the first 20 minutes, the movie starts to go downhill. When the Witch’s College closes down due to the war, Lansbury and the three children search out the school’s professor, played by David Tomlinson, to learn the last spell to help England during the war. 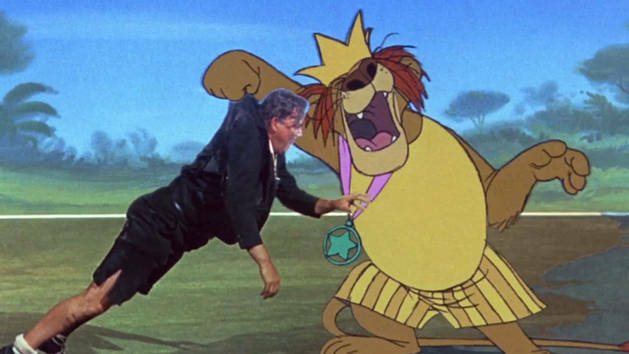 This hunt for the last spell takes the cast into an exhausting 20 or 30 minute bit in cartoon land, playing soccer with lions and dancing with fish. I was relatively interested in the film until they hopped into cartoon land. The mix of live action and cartoon was an innovative feature at the time, was popular with film critics and won an Academy Award. However, once the film goes into the cartoon portion, it seems to lose direction, not make much sense and drags everything to a halt. Along with the overly long cartoon portion of the film, half the cast in this film is wasted. I was excited to see Roddy McDowall, Reginald Owen and Sam Jaffe in the credits, but collectively, they are only in the two hour film for 10 minutes. While this movie was trying to recapture the magic of “Mary Poppins,” it simply falls flat. The children lack the charm of the kids in “Mary Poppins” and the songs aren’t as catchy, though they are also written by the wonderful Sherman brothers. One notable feature is the dance number for “Portobello Road.” It’s lengthy but impressive. The only irksome feature is that the female hair and costumes are not accurate for war era England. Angela Lansbury does end up being able to hold off Nazis, ready to attack the small English village, in a rather…creative way that is also a little creepy. Overall, while the film has a lovely cast and starts off having a cute storyline, it really is overly long and could do without the cartoons. This is a good example as how Disney films were declining in quality after Walt Disney’s death. This entry was posted in Musical Monday and tagged Angela Lansbury, Bedknobs and Broomsticks, Musical Monday, Walt Disney by Jnpickens. Bookmark the permalink. 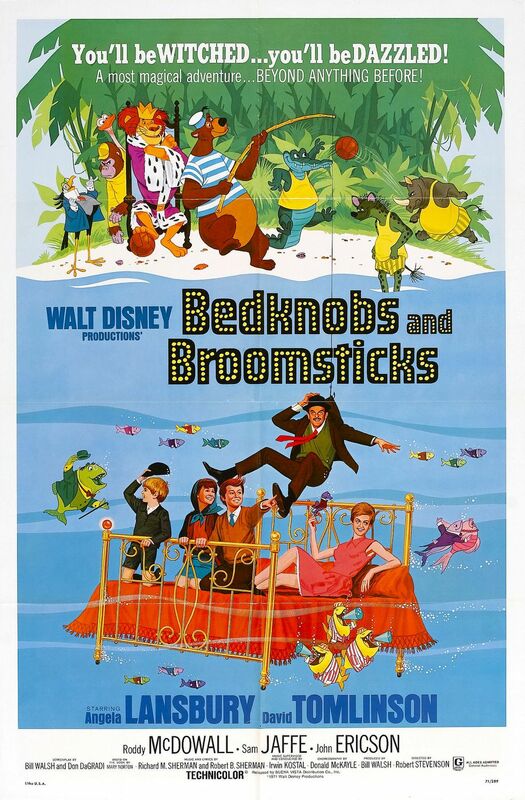 I have to disagree, I’ve seen Bedknobs and Broomsticks too many times to count, but I feel that it holds up over time just as well as Mary Poppins. It has plenty of “heart” and all of the elements Disney would have enjoyed to see in it had he been alive during its making. It’s true the cartoon number is out of sync with the rest of the film but – as the Sherman Bros – explained, that was because of a “committee” taking over the studio in place of one head. The original idea was to have a musical number in a English music hall with cartoon mixed in. That probably would have had more of the feel of Mary Poppins horse-race sequence. Anyway, great post..and thanks for including all the behind-the-scenes trivia. Julie Andrews would have been wonderful in the part too!